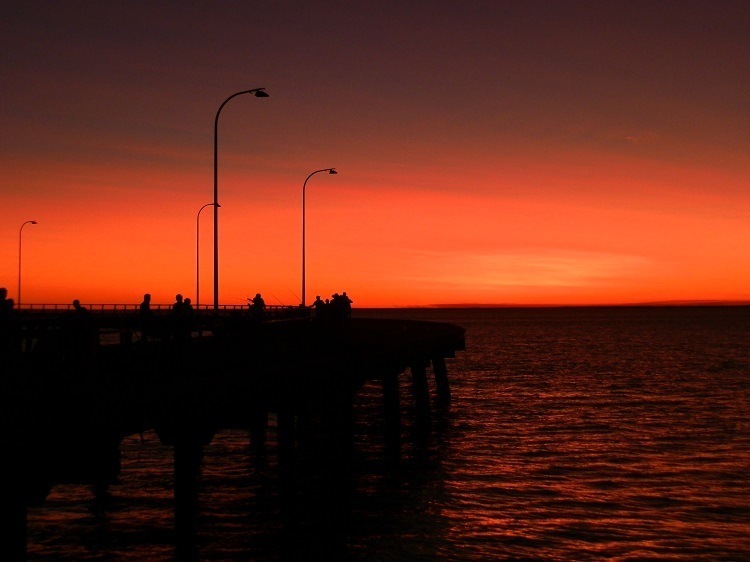 The splendiferous sun sank into the shadowy waters on this balmy OZ winter’s evening with a sensational splash of colour. The superb sunset would make a good stand-alone shot. But a prop or two would turn it into a GREAT one! My shutter finger itched wildly so I let it have its way. It wasn’t every day I got to photograph a sunset like this behind a jetty like that with people like those under perfectly placed photogenic street lamps! AND all against the swirling waters of Australia’s highest tide! With a range of up to 12 metres (39 feet), the tidal phenomenon is best viewed against the backdrop of the LOOONG jetty – and its street lamps – while crocodiles and sharks lurk in the muddied waters below. Influenced by the funnel-shaped coastline, as well as the normal tidal action of sun and moon, the extraordinary volume of water moving into and out of the Sound stirs up the mud deposited there during the wet season. Even a high tide of only 10.83 metres (35.5 feet) – like the first macro tide we saw at Derby – is a sea of brownish water lapping gently just below the jetty. So imagine how the King Tides that flood the whole car park would look! But low tide is a whole different story. It’s a LONG way down! Derby Jetty at Low Tide! The signs warning against falling from the wharf don’t detail the selection of fates that await – at low tide, there’s only the mud many metres below to break your fall. At high tide, you’re MUCH more likely to survive the plunge – but the strong currents are waiting to carry you off to the crocodiles! It’s no surprise the last passenger ship visited in 1973 – berthing a boat in conditions like these must be a logistical nightmare! But on the jetty as the sun sinks below the crocodile infested waters and a lone council worker with the unenviable task of moving the vehicles off the wharf before lock up starts his lonely rounds, the sky’s like a painting above us as the highest tide in Australia roars in and the stars come out. And the street lamps light up! « Postcard from … Nimbin, New South Wales! Wow wow wow! A spectacular set of shots! Thank you LadyFi! It’s amazing to see the changes in the tides!!! Wow, what a gorgeous set of photos! Beautiful sunsets! Like taken pictures of the moon, I cannot take a decent picture of a sunset or sunrise. In all three all I get is a bright blur. Wow, Red, here on our island we remark about how much bay bottom gets exposed on really low tides, but obviously we’re rank amateurs. Nice shots. Seeing that tide come in must be a very impressive sight, but I don’t think it could be any more impressive than your glorious sunset photos. They are worthy of a frame. Beautiful photos…Love the comparisons. Interesting how the same spot can appear so different. Our highest tides are in Eastport, close to Canada. Interesting post and amazing sunset photos. You’re making me wish I was there! Yu are one lucky (and talented!) woman; great to take advantage of a scene like this!! A post filled with gorgeous photographs. What great fun. And I love the commentary, too. But I would not like to get carried away to the crocs. Here all we have to worry about are gators. These are wonderful. Love that first shot. Oh those skies are incredible….who needs to jump into the water when looking up will get you these skies. I just love the way you made that picture with the people silhouetted so perfectly accenting the sunset instead of detracting from it. Fantastic. That sunset is Stupendous. I had not heard of these high tides but, I have to say it sounds like it might be best to avoid the water here if one wants to survive with all limbs in tact. Outstanding series, good choice for this theme! Wow, what a gorgeous RED sunset! Beautiful photos and a lovely scene. The tides are amazing! I would not mind seeing a shark or croc, just not up close! Have a happy weekend! In our “Tourist Traps” we generally sell T-Shirts. Stuck in mud waiting for the tide to bring in the crocks or sharks does not sound too appealing. Wpw – I’m loving these luscious vibrant colours! Great photos. really gorgeous photos. I love king tides, we used to get them at Port Pirie and the whole beach would be under water. Then I saw a couple at Semaphore while I was there. none were as pretty as these photos of yours. Derby Jetty is quite a sight. Fantastic shots, Red. Seeing a tide come in over the mangroves is a first for me. Never been to Derby but have sometimes looked at muddy mangrovey beaches and wondered what the attraction was. Now I know! 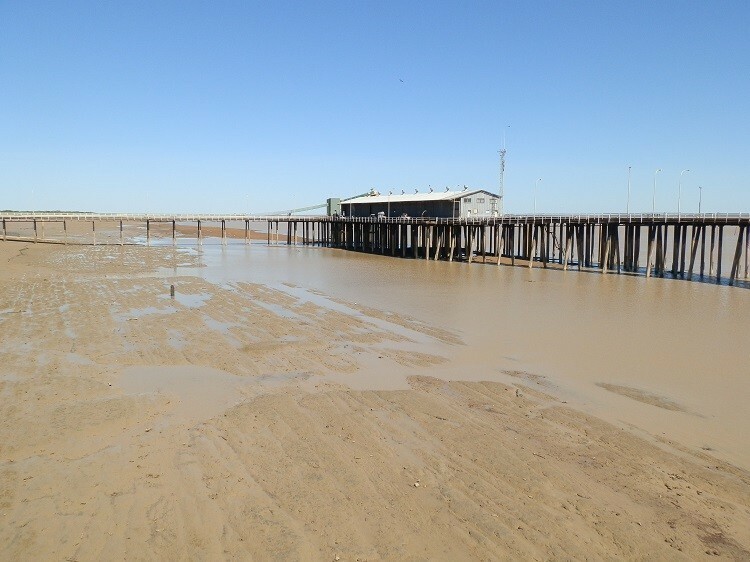 @Andrew – The difference between high & low tide is astounding – as is the variety of fates should one fall from the jetty … mud, crocs, strong currents, sharks – not quite sure which one I’d prefer if I had to pick! @Fun60 – You pay a price for paradise!! And the frisson of danger just adds to the enjoyment!! @Aleah – I walked very firmly along the middle of the jetty!! I wasn’t going to chance falling in at ANY time!! @Dianne – Who knew that so much of the pylon would be exposed? Actually, who knew there was that much of the pylon TO BE exposed??!! @TMWH – Haha, your idea of ‘fun’ is intriguing … I suspect you’d end up in an impromptu mud wrestling match!!! @Jo-Anne – 2012 was the first time to the Kimberley – and it sure as heck won’t be the last!! I’ve never seen such colours and sights – stay tuned, there’s a lot more to show you!! @Pauline – Every town should have a meeting place like this jetty!! On a balmy winter’s evening it’s entertainment, exercise and enjoyment for everyone! Amazing colours and terrific shots.. How lovely to see all those people out in the evening to enjoy the sunset. Great post! I can’t get over the incredible colours as the sun sets. Then you have to spoil that picture of paradise with the tales of what lurks beneath! Yuk. So beautiful, those sunset shots! Low tide looks like it would be fun to walk in the mud a bit, as long as it was near a ladder to climb back up to the pier! Beautiful that really red sunset. We were on our way to Derby when the vehicle decided not to go, therefore we had to be towed to Broome. 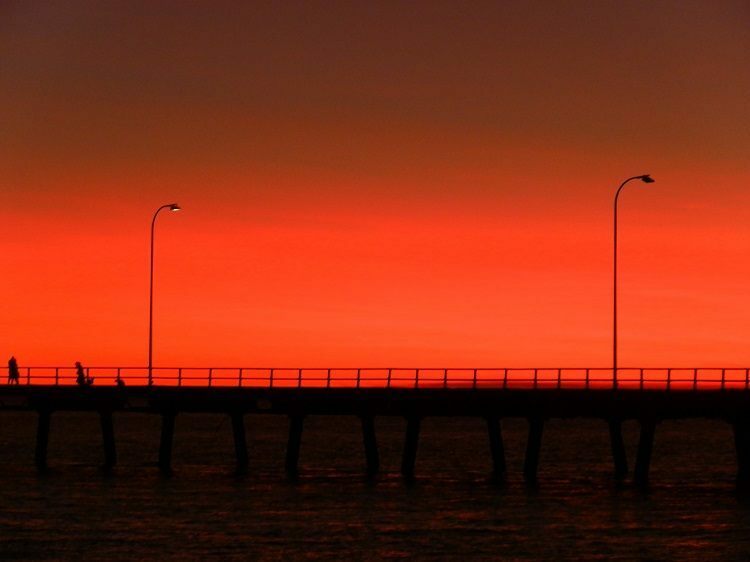 Love your captures of Red sunset looking out onto the edge of the world …. and amazing low tide shots … Wow! amazing to see all those pylons. Incredible colors of the sunset! Perfectly match your name 🙂 I wouldn’t want to fall down during low tide. The mud may break my fall, but it will be like quicksand. Yikes! Certainly bright colours. These massive tides intrigue me. Maybe one day I will see them. Crocs again. Australia is not fit for habitation above a certain latitude, never mind the tiny jellyfish in our northern sea waters I heard about to today with two metre long tentacles as thin as a hair and you don’t feel their sting. You just die later.